Having active fathers in children's lives can make all the difference between success and failure for that child. A new fatherhood initiative facilitated by Akron Community Foundation will combine the services of three prominent organizations to provide more focused education and resources to fathers and families in Summit County. The Summit County Fatherhood Initiative, announced Sept. 19 at Helen Arnold Elementary School, comprises three local organizations: Fame Fathers, Fathers & Sons of Northeast Ohio and Man2Man. Through recent funding from the Akron Community Foundation, the three organizations are aligning their services to ensure the greatest positive impact for families in Summit County while sharing a common goal of helping at-risk fathers and young men become strong nurturing parents and mentors in the community. "The Akron Community Foundation takes very seriously our role as a convener in our community," said John Garofalo, Vice President of Community Investment at Akron Community Foundation. "We are the trusted third party that can bring smart people together to tackle important problems. We are also a funder that can spend money on a solution." The announcement coincides with the annual Father's Walk, during which thousands of local fathers, grandfathers, uncles and other significant male caregivers and mentors walk or drive their children to school to show support of their education. Starting out with 500 fathers walking their children to school four years ago, the Fathers Walk event has grown to more than 4,000 participants, said the Rev. Eugene Norris, CEO of Fame Fathers. "It shows tremendous initiative that our fathers want to be involved." Norris noted that Akron Community Foundation was the “first to step up to the plate” and fund this critical initiative. "Education is probably the heart of any good fatherhood program," said Don Lykes, Founder of Fathers & Sons of Northeast Ohio. He said the group wants to increase the awareness of fathers, change attitudes about child support and responsibilities, and help fathers establish behavioural changes over a long period of time. Lykes said the combined effort will better help young fathers plan for their families, along with helping fathers re-entering society to repair their family relationships. “Navigating the system also is a challenge, whether it's figuring out what to wear to court or how to address the magistrate,” said Lykes. Mentoring is important, too, especially father-to-father mentoring. He added, "We take a dad who has some life experience who helps other dads practice responsible fatherhood." Another new element to the collaboration, said Lykes, is "Dad's 1st Call 4 Help”, a new program in Summit County that works with Info Line to provide immediate access to information for those fathers seeking local resources. "The reflection of a son's character is a father's worth, and the measure of a father's worth is shown through a son's character," said Frank Williams, of the Man2Man Fatherhood Building Program. "We need fathers in our children’s lives." According to the National Fatherhood Initiative, children with absent fathers are two to three times more likely to live in poverty, use drugs and become teen parents. Conversely, a healthy father-child relationship is correlated with better academic performance and fewer behavioural problems. “These statistics underline the need for a countywide initiative focused specifically on fatherhood,” Garofalo said. “The combined groups have shown this character and are working together on a common goal -- making men better fathers,” he added. Akron Community Foundation Board Member Olivia Demas was instrumental in helping to set up the fatherhood collaboration. "I know this collaboration is just the beginning of wonderful things that will happen in Summit County," said Demas, a member of Akron Community Foundation’s Distribution Committee and member of the Fatherhood Initiative’s Steering Committee. “This collaboration mirrors other successful partnerships in the community, like Bridges out of Poverty and the county's re-entry program,” said Devoe Johnson, Senior Director of Community Impact for United Way of Summit County. "We are so encouraged to see how you came together," he said to the three fatherhood groups at the press conference. 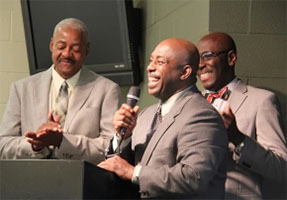 Johnson also is a member of the Fatherhood Initiative's Steering Committee. "We as fathers know how much organizations like this are needed in this community," said Akron's Assistant to the Mayor for Community Relations, Billy Soule, who presented a proclamation from Mayor Don Plusquellic, proclaiming Sept. 19, 2013 as Fathers Walk Day in Akron.